I’m trying to get back into the swing of things. Life is slowly getting back to normal — well, a new normal, that is. Grief is a funny thing, because even if you’ve been through it before, the pain never gets easier. But I have learned that the only way to get through it is to just live, every day, putting one foot in front of the other. And eventually, I find ground again. It’s taken me a while to regain my passion for anything again, but I’m getting there. Even food was tasteless for so long — too long. How I dearly missed the good taste of food, and baking. It was hard to get myself back into the kitchen, to dip my hands into the cool flour and hear the gentle whir of dough kneading in the stand mixer. But once those familiar senses returned, so did my rhythm: Rhythm in a new reality, maybe, but one in which baking still fills me with joy. OK. You can watch it. But then immediately bake this bread, please. In just a couple of hours, your kitchen will smell heavenly, like a warm cloud of cinnamony, raisiny, sugary goodness. 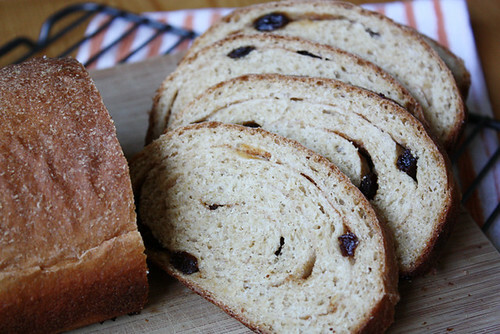 And when you slice into this bread and take a whiff of those pretty cinnamon swirls studded with soft, sweet raisins and then top it with butter, peanut butter, jam or cream cheese, you might begin to question whether or not this really is real life. It is real life, my friend. Even in a downtrodden world, where crappy things happen that we can’t always understand, good things — like yummy, homemade bread — can still happen, too. In the bowl of a stand mixer, combine water, oil, sugar, skim milk powder, salt and yeast. Whisk with paddle attachment until well blended and let sit 5 minutes. Add in a cup of flour and stir to combine. Add in another cup of flour and repeat. Replace paddle attachment with dough hook and increase speed to medium. Add just enough of remaining flour until dough is slightly sticky, but pulls away from the sides of the bowl (you might have to add more than 2 1/2 cups flour total, but try not to go over too much). Knead five minutes in stand mixer or 10 minutes by hand, until dough is smooth and elastic. Place in a lightly greased bowl, cover with lightly greased plastic wrap and let rise until doubled, about 1 hour. 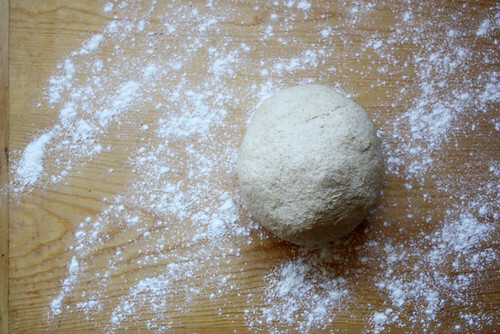 Punch down risen dough and, on a lightly floured surface, roll out to a 9 x 14-inch rectangle. 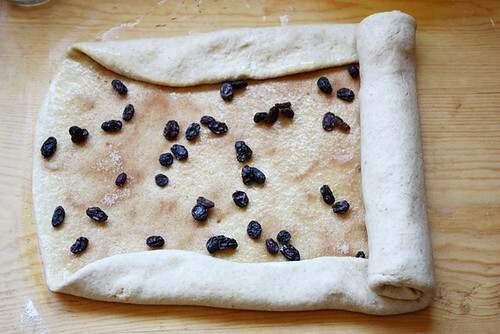 Top dough with egg wash, cinnamon, raisins and sugar. Bring in the long sides by a 1/2-inch and carefully roll up dough from the short side, careful to keep sides tucked in. Pinch seam closed with slightly wet fingers. Place bread in a lightly greased 8 x 4-inch loaf pan, cover with lightly greased plastic wrap and let rise until doubled, about 1 to 1 1/2 hours. Preheat oven to 375 degrees F. Remove plastic wrap from top of loaf pan and bake until bread is a deep, golden brown and makes a hollow sound when you thwack it on the bottom, about 30 minutes. Remove from oven and loaf pan and cool completely on a cooling rack before slicing. Glad you’re getting back in the swing of things, honey. I’m relating—because life seemed so strange and out of place this week after the hurricane. Everywhere I looked–utter destruction. How can I feel like getting dressed up and pretty when my rain boots are still caked in mud and downtown is empty and my friends are still stranded in towns being airlifted food and I can’t get to work and my town and state and region are a mess? It’s tough. So I’m glad to hear you’re getting there, slowly. You always have such a beautiful way with words. You are right – the pain never gets easier, but I’m so glad you are finding strength and moving forward. 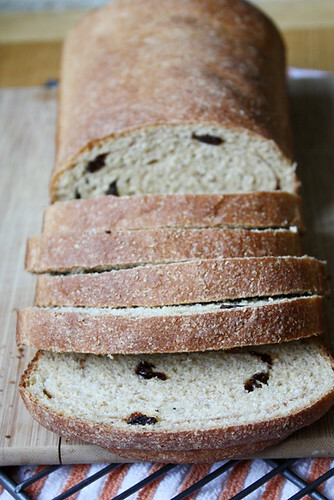 The cinnamon bread looks divine! I have it bookmarked for when this sunny California weather cools down. 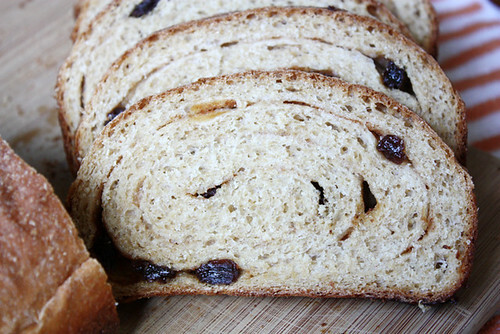 Have you ever had trouble with big holes in the bread with this kind of recipe? I just made something similar yesterday and big hole on the top half. I’m not sure if I let it raise to high or I thought I rolled it tightly, or what? Just curious. Hi Jenny — No, I’m sorry, I haven’t had that issue before! It could be that too much yeast or flour was used. I’m bummed for you, but I hope it still tasted good! Is there a print button somewhere on this page?